I met Nancy and Elia in Brussels. We connected at the first movement. So they invited me to create the music (accordion / sax / voice / electronics) of their new creation. they work for one month and I’ll join them the last week , in Catania Sicilia for 5 days working and 2 Performances in the « SCENARIO PUBBLICO international choreographic centre of sicily ». feet. They walk following the rhythms of their feet. As they move, they call out elements of nature as they pass through, creating songs. They sing the world around them to life integrating movement and breath. They call it: “Songlines”. They trade these songs with their neighbors to negotiate land. Their culture is based on physicality and imagination, by navigating and negotiating, from their feet through their mouths. Our practice investigates our physicality and our breath. We practice Qigong, Flying Low, Breakdancing, Release, and the dramaturgy of the theater. 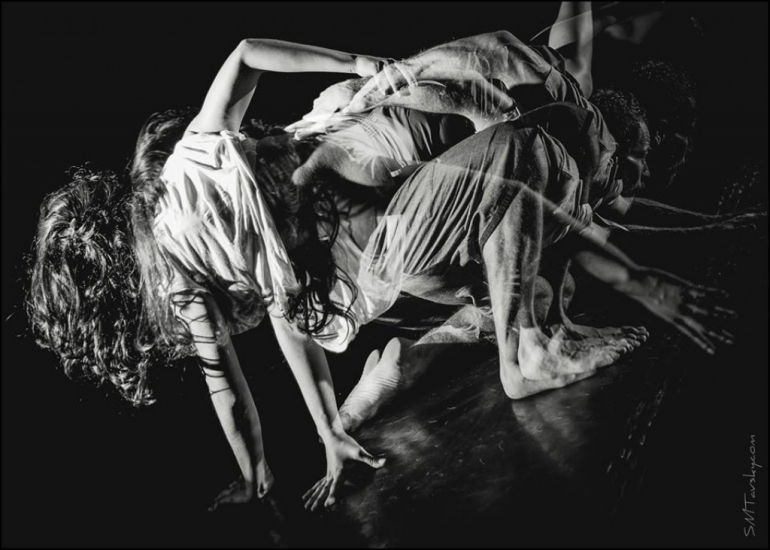 To create our performance, we use breath, touch, floorwork, running, walking, rhythm and text. We are creating a performance that communicates the link between ancient culture and contemporary dance. We picked this residency because we want to work with the dancers from Compagnia Zappalà Danza. This residency is focused on deepening and sharing our practice. We want to teach and train with a larger group. We will then rehearse with a smaller group (3­5 dancers) to create. This will include solos, duos, trios and group work. The final piece will be 5­7 performers. After the residency and initial performances, the project hopes to tour in Mexico, USA, Argentina and Europe, through festivals and co­productions with theaters and universities.